See ya later bread and hello sweet potatoes. 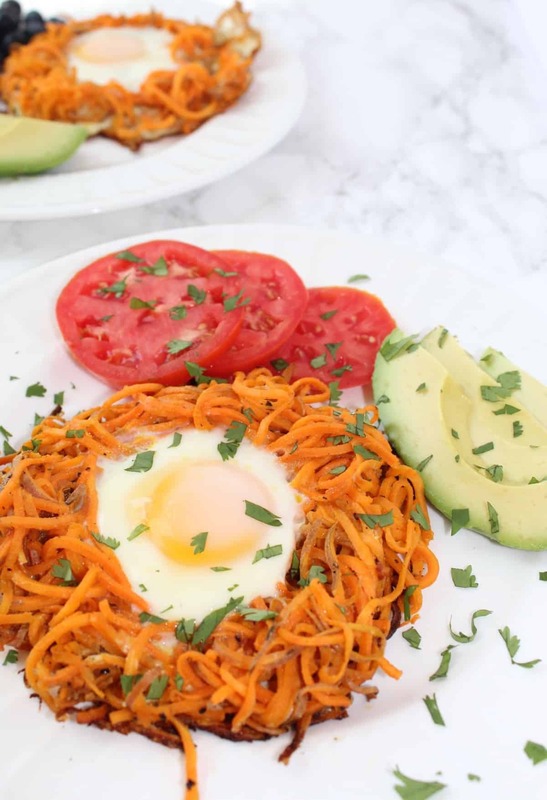 This Sweet Potato Egg in a Hole uses spiralized sweet potatoes as a nest to hold your eggs, making breakfast gluten free, paleo, nutritious, and fun! Who needs bread when you have sweet potatoes?! Seriously though. If you haven’t seen, sweet potato toast is all the rage right now. One of the biggest trends is sweet potato toast – it’s genius and I have been making it on the regular now. I especially love a sweet and savory combo for breakfast. This idea really got me thinking of easy replacements of bread and other foods that can be easily swapped for healthier alternatives. I had some extra spiralized sweet potatoes in the fridge just waiting to be used. I was sautéing some up for breakfast one morning and boom the idea just popped into my head. 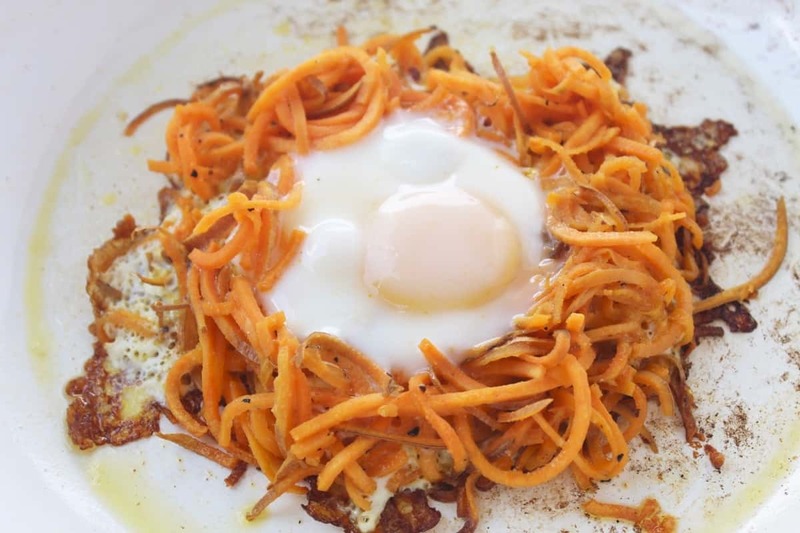 Why not make a rendition of eggs in a hole and use these sweet potatoes instead. Don’t you just love it when things just work out like that? 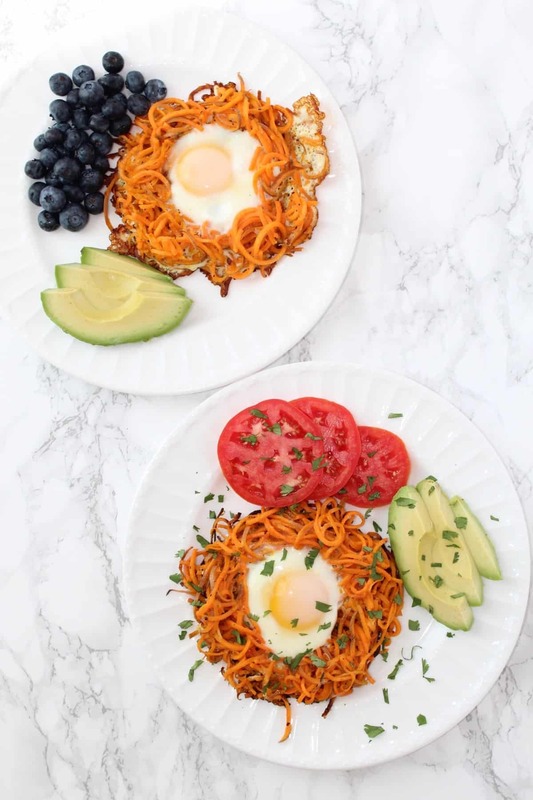 If you don’t have a spiralizer, you need to get one! They make eating veggies so fun! I have been obsessed with sweet potatoes for quite some time now. Who needs white potatoes when you can have sweet?! Well the bf thinks otherwise, but that just means more for me. 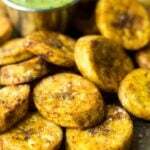 Sweet potatoes are a great source of fiber, vitamin A, and potassium. They rank lower on the glycemic index than white potatoes, so you don’t get that spike of sugar. Perfect for breakfast. 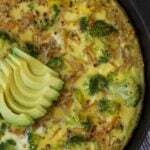 Pair with some other veggies, avocado, and fruit and you have a breakfast packed with protein, carbs, and healthy fats. This recipe really couldn’t be easier. 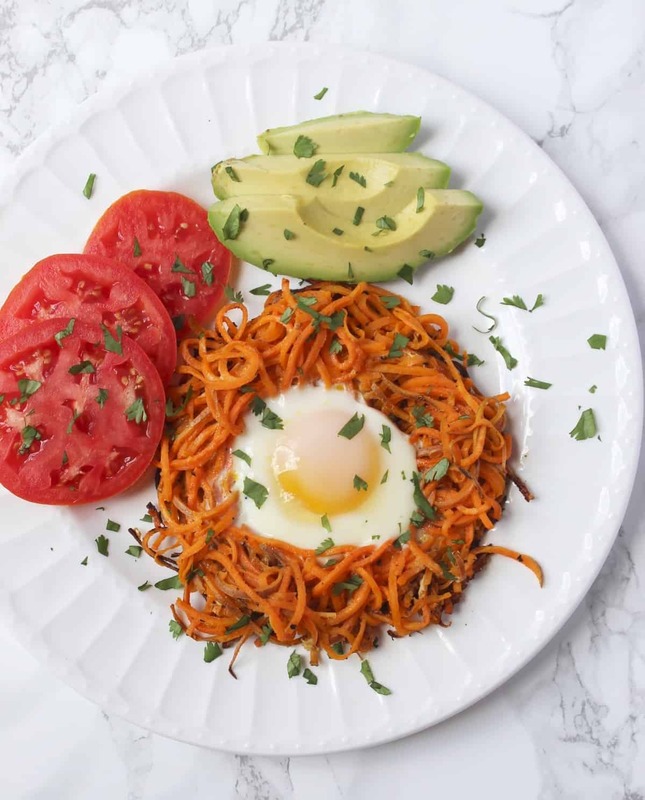 All you have to do is spiralize some sweet potatoes (or get them from the store to make it extra easy! ), sauté them up with some garlic powder or whatever spices you prefer, make a “nest”, and then add your egg. I add some egg whites so it stays together a little better, but it’s totally optional. Than just serve with your favorite breakfast sides! 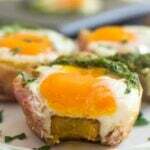 These sweet potato egg in a hole also save well. I made two and then saved one for the next morning. Just heat up a sauté pan, add some oil, and throw it in there till it warms through. Makes for a perfect quick breakfast. Side note – I didn’t even know what eggs in a hole was before college. A friend mentioned it one day and it blew my mind. Pretty genius to fry up the bread and the egg together. I may or may not have made a few on some drunk nights back in the day 😉 At least it wasn’t pizza all the time right?? Cut the ends off your sweet potato. 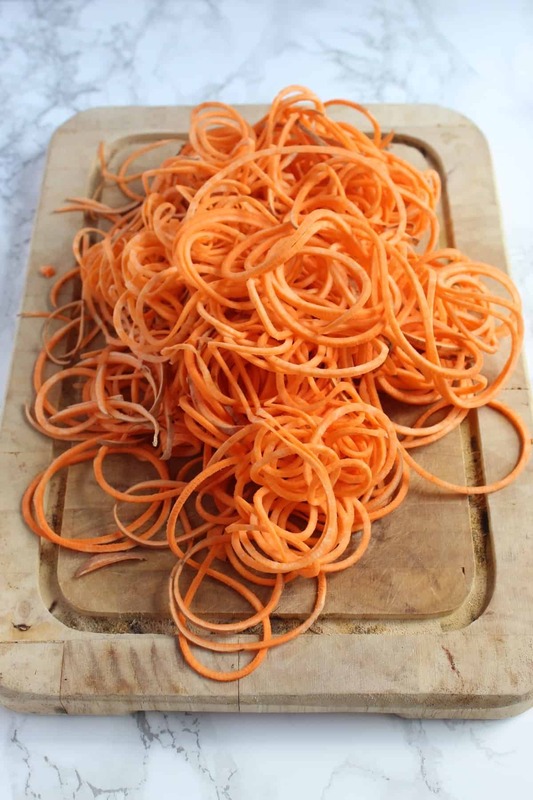 Place in spiralizer and spiralize using the smallest noodle shape. Trim the noodles so they are not too long. Heat a medium-sized sauté pan over medium heat and add 1 tablespoon coconut oil. Once hot add sweet potatoes, garlic powder, and salt and pepper and cook for 3-5 minutes until soft. Once done place in a bowl. Turn heat down to medium-low and add 1/2 teaspoon coconut oil. Add half the sweet potato mixture and form into a nest type shape with a hole in the middle, leaving room for the egg. Pour 2 tablespoons egg whites on sweet potatoes. Add egg in the middle and cook for 4-8 minutes, or until cooked to your preference. Serve with sides of choice. Enjoy! *If your pan is large enough, you can make both egg nests in one step. Do you like sweet or savory breakfasts? Do you use any fun alternatives for bread? Thanks Kelsey! And yes, someone was super kind and let me know how to update it 😉 I’m digging it too! 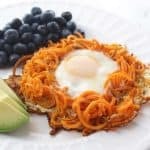 Do I sweet potatoes and eggs every day for breakfast but I LOVE the idea of spiralizing the tater to keep the texture interesting! Great idea and recipe! Thanks so much Chrissa! 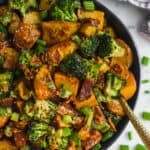 And yes, it is a nice change from regular baked or sautéed cubed sweet potatoes! This was delicious! I didn’t add any egg white. Flipped egg to cook both sides. Will make again! No need to remove the potato. Just make a couple of nests then add egg. So glad you liked it Stacey! Thanks for trying it! 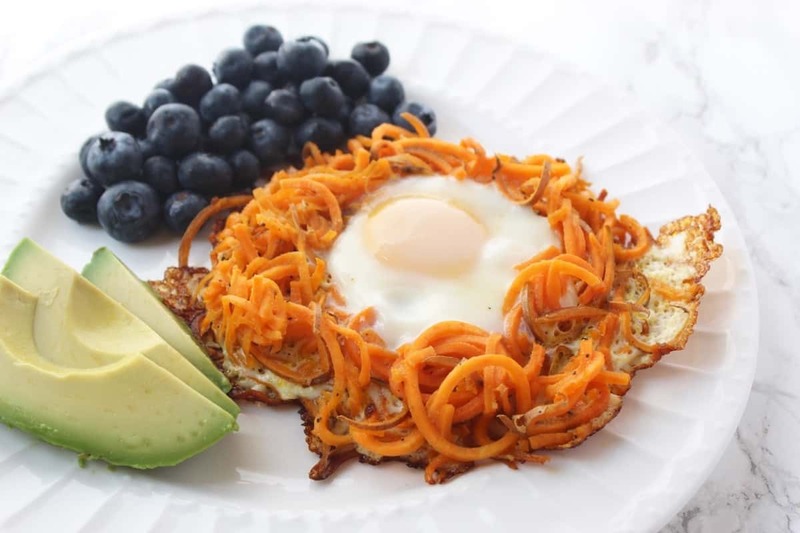 I love the sweet potato /egg combo (I usually do it as a runny egg over a paleo sweet potato waffle), great way to add a little texture variety. Thanks! Sidnote – you should look for white sweet potatoes sometimes (there are a bunch of varieties – brown skin/white flesh, brown skin/purple flesh, purple skin/flesh). They are great for those recipes where you still want a bit of sweet, but not as much as your typical “orange” sweet is gonna give you. Thanks Amy, I feel like egg and sweet potato can’t be beat! Also, I will definitely be on the look out for white sweet potatoes. I have tried purples ones, but haven’t seen the white flesh yet. 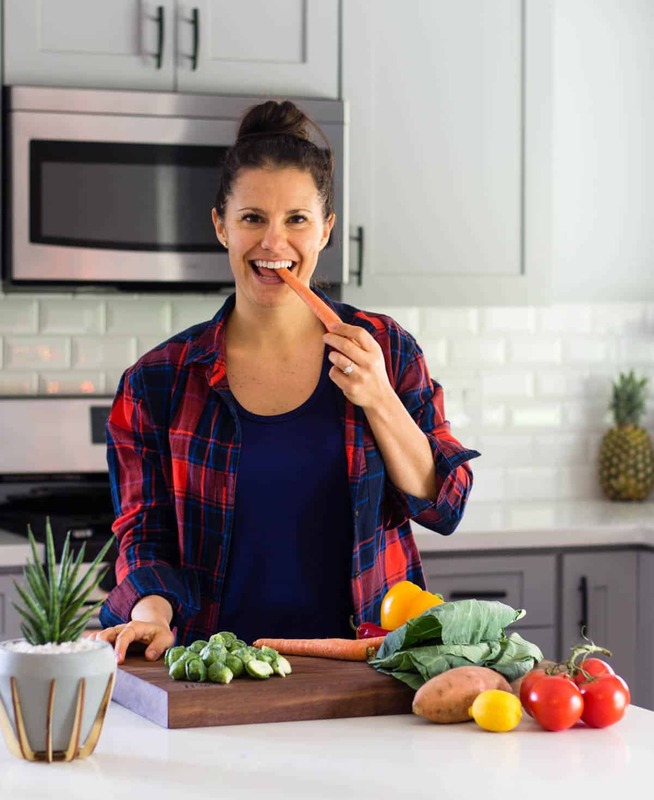 I am always looking for new veggies to try! Thank you! Way too much advertising on this page! Sorry, but I cannot be bothered to find a recipe in the jungle of adds. Hi Maria, I’m sorry you feel this way. I recently just put ads on my site this month and am seeing how they go. Running a blog is not free and a lot of hard work and time goes into it. I will see what I can do about them and change them up. I’m sorry it was an inconvenience for you and I hope it doesn’t stop you from trying one of my recipes. Thank you for the feedback. All you literally have to do is SCROLL PAST THE ADS. And if you can’t be bothered, spend your own money testing recipes and maintaining a blog. It’s not free, and it’s not easy. True! Sooo very true indeed! We gave this a try the other night with our whole family. My 6 year old helped me in the kitchen. 🙂 Both she and the 3 year old thought it was a super fun idea! The 3 year old didn’t like the garlic powder so I’ll make her a plain batch next time. I just whipped this up for brunch–so delicious! I think I might fry one side of the nest and flip it before I add the egg next time to maximize that crispiness. Thanks for a super easy and delicious recipe! Ohh that is such a good idea! So glad you liked them Katie, thanks for trying! This was fantastic! 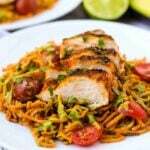 I made this with the 1st use of my Spiralizer and couldn’t have been more pleased. Oh heck yeah!! So happy to hear that Debbie, thank you for trying it!